We're talking about cropped sensors, not cropped images. It does not matter how you crop the image! If you need to stretch a 1cm image to 100cm output size, the aberrations of the lens will be more visible than if you stretch a 2cm image to 100cm output size. This is obvious so it is a bit odd how someone gets the motivation to argue it. Apparently you didn't bother to read what I wrote and have wrote before in this thread. You're now talking about apples and oranges. The point made was the more you need to enlarge an image, the more the aberrations will show, thus the lower the resolution will be. This of course only applies to the same lens only and that's been the thing I've made an argument about. What you are now doing is that you're changing the lens. That is beside the point I was making, as the point was about how small sensor stresses the lens more than a larger one. The same lens, not a different one. I've claimed just this all the time. Maybe you just misunderstood? claim is merely that if a lens made for FF is used with MFT it will perform less well than if it is used with the format for which it was originally made. In what way is that trivial claim an inherent advantage of the larger format? All the lenses I use with MFT are made for MFT. If the lenses are equally good, the larger format has an inherit advantage. This is what I claimed. If you scale the lenses perfectly down, you improve the lens as you reduce the aberrations. The simple statement I made means that if your m43 lenses perform as well as comparable lenses work on FF, then the m43 lenses are optically superior. If they were not, the system woud perform less well due to the aberrations being magnified more. What I don't understand how something this simple and elementary can cause a storm of opposition or disbelief. Maybe you misunderstood me? 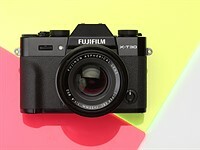 I didn't say that FF is better than m43 of big format is better than smaller one, but touched one little bit of optics. Also, since you only use m43-lenses this has no practical effect on you, but many use mirrorless on adapted lenses where the performance may be less than the user expects based on how the lens performs on the system it was designed for.